So, today's post isn't the usual sort of post I'd share on my blog and it's rather personal to me. 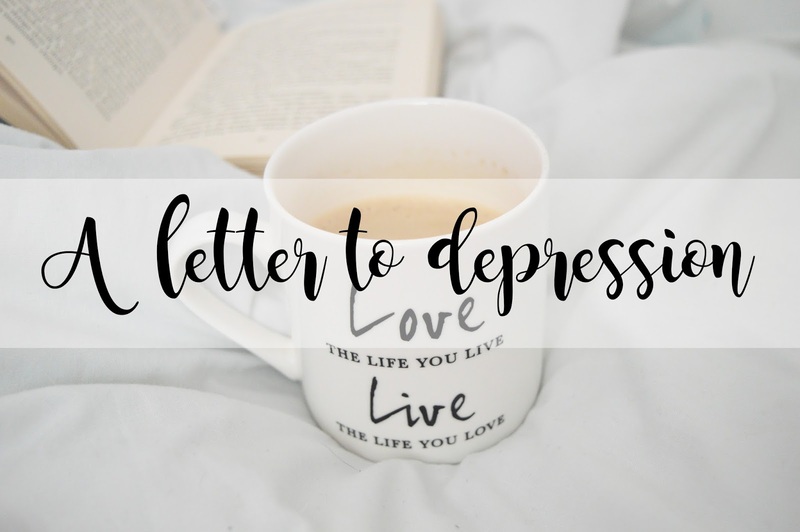 I wanted to basically share my feelings and emotions about depression all in one post, to let everything out! Seeing as my blog is part of me, and I share a lot of what happens in my life on my blog, I thought it was only right to share this too and you never know, it might encourage others to speak up, or to share their experiences too. I don't hate you, but I don't love you either. I'd say I dislike you. Although you've put me through a lot of pain and a heck load of tears, you have also taught me a lot in the years you've been around. You've taught my my wellbeing is more important than anything in this world. My happiness comes before anything, and I mean anything. Although you taught me in the most painful way possible, you taught me how I shouldn't let guys trample over me and to be the strongest character I can possibly be when I'm in a relationship. When I started experience you many years ago, I didn't know what you actually were. I just thought I always felt down and upset over anything, hormones possibly? I had lack of education about you, because this is something I weren't taught at school and I guess I never really thought about googling "Depression" and seeing what it came up with, as it wasn't something I was interested in and I didn't need to know about it. You tried to take everything away from me. My life, myself, my beliefs and my purpose in this world. I can't forget my friendships either, I lost a lot of friendships because of you. You forced my tears every day, and you forced heart breaks too, a fair few of them. The most heart breaking part about it all, you're also forcing tears right now while I write this, because I guess that's your purpose, hurting people, reminding them about everything which is negative in this world. Why would you try and take away everything? Because of you, I didn't want a life, and I didn't want a future so I tried to end it. However, this made me realise something. Through it all, you made me a stronger person. I was able to fight through it all and see the light at the end of the tunnel. Because of you, the smallest things don't hurt me anymore and I try and see the positive in everything. Because of you, I'm now happy and I never thought I would be again after everything you put me through. After experiencing you, I wanted to help people like me, who you also try to ruin. To support them and listen to them, when there's no one around for them to speak too just to let everything out. You also made me realise what self belief was, and my purpose in this world. I have more belief in my self now than I ever did before you came. I believe anything is possible as long as I try. My purpose is to help people, support them and to see them grow. Whether these are my friends, my family or the little people I'll be teaching one day; helping them to grow into stronger and better people. Lastly, through it all, you taught me that it's okay not to be okay and how a permanent solution wouldn't help something which is only temporary. Time passes by and in this time, we grow, but you grow with us to build us up to be stronger and better than before. Although you hurt me for so long, I'm sort of glad you came into my life because I wouldn't be who I am today if it weren't for you.